You might be surprised to learn that the battery your car came with isn’t the best for your automobile. 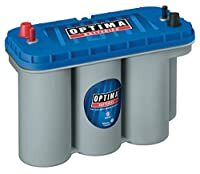 This is why Optima battery has been taking care of vehicle for years and today I want to look at the Optima Battery Review. 2 Optima Battery Reviews: Which is the Best for You? 2.7 What’s it built for? 3 So, How do you Choose the Right Battery for Your Car? 5 RedTop vs. YellowTop vs. BlueTop: What’s the Difference? 6 Recommended: Which is Really the Best? Optima Battery Reviews: Which is the Best for You? Kicking off our Optima battery reviews is the Optima 34/78 RedTop. This battery packs some of the highest cold cranking amps out there. And to further sweeten the deal, it also brings some monstrous specs to the table. Starting off, you’ll notice this battery packs far more cold cranking amps than other batteries on our list. And for that matter, 800 CCA is one of the highest values on the market! With that said, you’ll have no problems getting your car started on those bone-chilling December nights. If that’s not enough, keep in mind that the 34/78 RedTop is also vibration resistant. So this battery is begging you to take it along with you on your off-roading adventures. Not only that, but it makes it a downright durable battery as well! Alongside durability, you’ll find this battery is ultra-reliable as well. After all, a 100-minute reserve capacity is no joke. Parasitic drain isn’t even an issue at this point. So go ahead and install that bass-heavy power-stereo system in your car! I certainly did. And I experienced no light flickering and no shortages with this battery! Lastly, installation couldn’t be easier. You don’t even need to know what a bearing is to successfully place it in your car. Optima even throws in a few brackets to ensure a perfect fit. When I gave it a try, it only took a matter of minutes to get it in a 2004 Mustang. So it’s pretty simple as well. 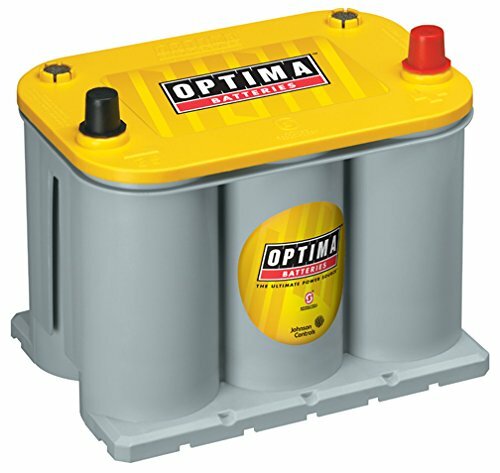 The Optima 8004-003 34/78 is an exceptional starting battery. However, with its high reserve capacity, it’s also great for cars with lots of electronics. 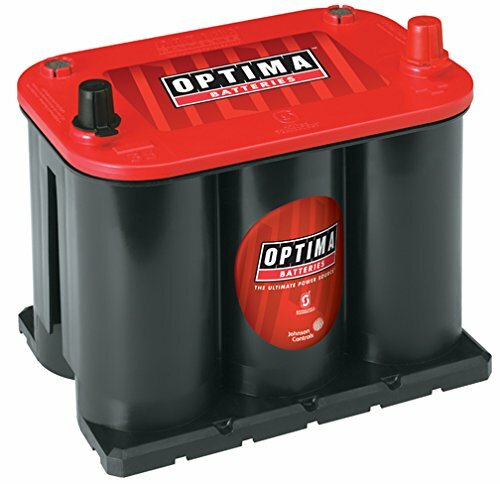 Optima Batteries OPT8020-164 35 RedTop is ideal for starting your car. Next on our list is a battery that’s more compact in size. And this is one of those instances where smaller is better. But of course, this battery also packs plenty of features for any fun you’ll have in your car along the way. As already mentioned, this battery is smaller in size. Therefore, it’ll have no problems fitting in most cars out there. You’ll even get a plastic trey to help with getting the fit just right. Another nice feature here is the battery’s spill-proof nature. So say goodbye to those spills that result from accidentally slamming into potholes. During my tests, I even accidentally slammed into a nasty curb, and still no mess! Now that’s quality design. This battery is also easy to recharge. Just align your positive and negative terminals with another battery and you’re good to go! It’s really as simple as jump-starting a car. This battery is ideal for starting your car. You’ll want a battery that’ll last you years to come, right? Of course you do! And it’s hard to find a starting battery that lasts longer than the Optima 25 RedTop. First of all, the battery life is one of the best you’ll find on a RedTop. On average, it lasts every bit of 2-4 years. Even longer if you take good care of it. That’s some reliability and long-term savings right there! Also noteworthy is this battery’s durability. After all, it’s built for high-performance situations. So if you ever take your car to the track, don’t be afraid of a hard launch. For that matter, embrace the hard launch. This battery can take it! Trust me, I successfully tried! Note that this battery also allows for a pretty high number of cold cranking amps. So with that said, you can use it anywhere in the US, at any time ! When I tried, I noticed the car started in cold weather just as well as it did in mild temperatures. 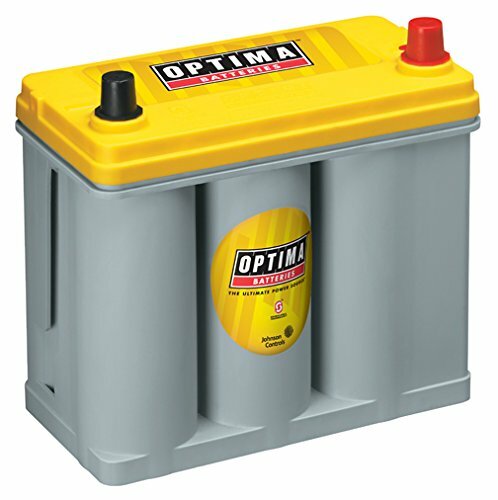 The Optima 25 RedTop is a great starting battery. This battery excels at powering the electronics in your car. It’s finally time to get to the deep cycle batteries. And this one here happens to work great for those show-cars you don’t drive daily. The first notable feature about this deep cycle is its cranking amps. In general, it pumps out 575, which is pretty high. I was quite surprised when I flipped that ignition switch and the car powered up instantly . And remember when I said this battery is perfect for those cars you don’t drive every day? This deep cycle will allow you to store your car for months at a time without the use of a trickle cycle. Then, when your prized horsepower toys awaken from their hibernation in spring, the battery still works as good as new! Take a look at the dimensions and you’ll notice this battery is pretty tiny. That’s great news since it allows you to use it in a handful of cars. These compact dimensions also allow this battery to fit perfectly inside of your hybrids and EVs. A deep cycle with decent cold cranking amps? No, you’re not dreaming. This combination does exist! And you’ll get exactly that with the Optima D35 YellowTop. You can’t look at this battery without noticing the cold cranking amps. 620 CCA is simply incredible for a deep cycle battery. It’s more than enough to allow you to reliably start your car on those ultra-cold winter evenings. So this spec alone sets it ahead of other deep cycles you’ll find on the market. It’s also nice to note that this battery is maintenance free. So you won’t need to worry about getting your hands dirty, adding any water, or cleaning up any spills. Even better, I never experienced any leakage or corrosion during our time with it. Lastly, keep in mind this battery packs one of the best reserve capacities you’ll find on the market. So go ahead and drop the bass with your aftermarket sound system. Not only can your car handle it without the electric parts going crazy, but it also just feels good. Overall, this battery works great for powering your cars with tons of electronic hookups. If you are looking for an Optima Deep Cycle Battery for your RV, then the D34M is the model for you. I am recommending you this battery since it’s a dual purpose unit. What I mean is it acts a starting and a deep cycle battery. Also, it is a sure-starting 12V and maintenance-free battery that will really serve your purpose. 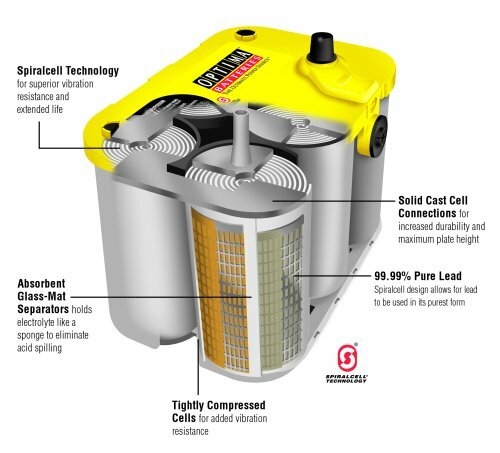 It provides sufficient power even when the conditions are harsh to run your boats, RVs, and motorhomes. This is made possible thanks to the SpiralCell design as well as continuous lead plates. Besides, I love the fact that its design has the ability to provide a clean, strong, and safe source of power. This lightweight battery also has a high reserve capacity and superb starting power. Another good thing about the D34M is the ability to resist vibration and provision of a long shelf-life. Unique design and Lightweight construction. Prone to damage if hit. It is built for starting and deep cycling of RVs and boats. 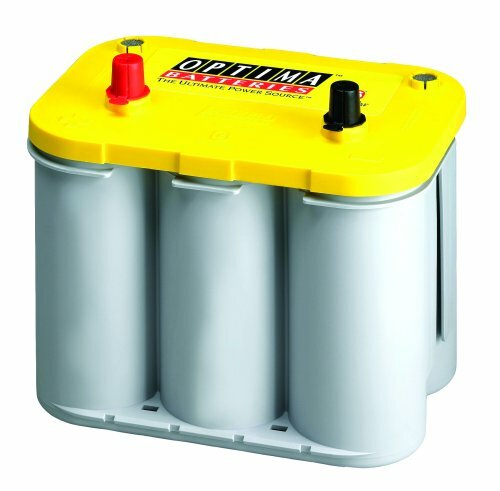 Another great Optima Deep Cycle Marine Battery that will also start your boats is the D31M. One amazing thing about the battery is the unbelievable 155 minutes of reserve capacity. In fact, I found out that this is the main reason why it works effectively for deep cycling. D31M is a double-purpose battery, which can start and deep cycle your boat. It’s also easy to mount in your car, boat, or any other place you want to use it. Also, I am excited to inform you that it’s a double-purpose battery, which can start and deep cycle your boat. Its starting power is also impressive, rated at 900 CCA – this is so powerful. Furthermore, you will find it very easy to mount in your car, boat, or any other place you want to use it. The durable and rugged construction of the D31M is another plus, which I can attribute to the polypropylene exterior. Also, it features a design that protects it from spills and vibrations. And it is able to handle several recharges. Doesn’t spill even when there are vibrations. Able to handle several recharges. Just like the D34M, this battery is ideal for starting and deep cycling. This battery is mainly built to function as a secondary battery for the jeep. 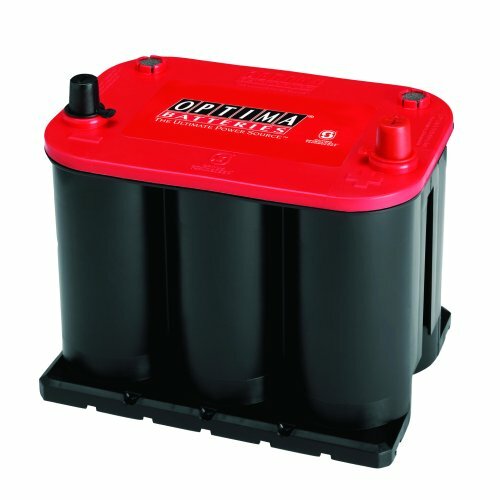 Within the Optima batteries collection, most people consider the Red Top as the starter battery. 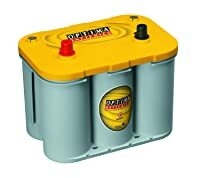 And as you will find from this Optima Yellow Top Battery Review, there is a reason for that. Due to its hybridize nature of the conventional lead-acid and AGM type of battery, this battery is mainly for the jeep. The main benefit of this battery is the ability to maintain a steady self-discharge state than a traditional battery. This means that it will stay longer with a full charge before getting drained than other batteries. In terms of specs, nothing really stands out or truly damning about the Optima Batteries 8012-021 D34. As long as your needs are basic, this battery will be fine. Still, you will enjoy a 120 minutes reserve capacity that is quite awesome. The battery also has some decent level of vibration resistance, although this has to do with the AGM construction. Not suitable for running most cars. 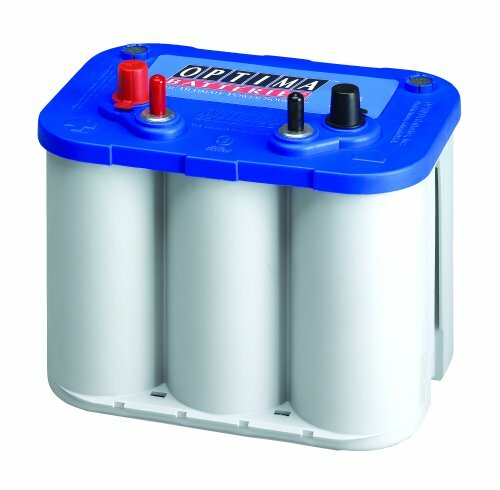 The Optima 8037-127 D27F is the ultimate Optima Marine Battery that has enough power for starting boats. As I noted, it is also a great battery for running the different accessories in your marine gear. With a high reserve capacity and CCA rating, this battery is surely a deep-cycling battery. It is able to provide all the power you require when in the sea and it also acts as an Optima Motorcycle Battery. And you don’t need to worry about its durability, the battery features 99.9 percent lead cells that enhances its life. But I must remind you that your battery will last according to how you handle it. Another thing has to be its ability to withstand resistance. You might know how the sea is rough with all manner of tides. It is also a compact battery, meaning that it fits in limited spaces. Withstands rough tides in the sea. 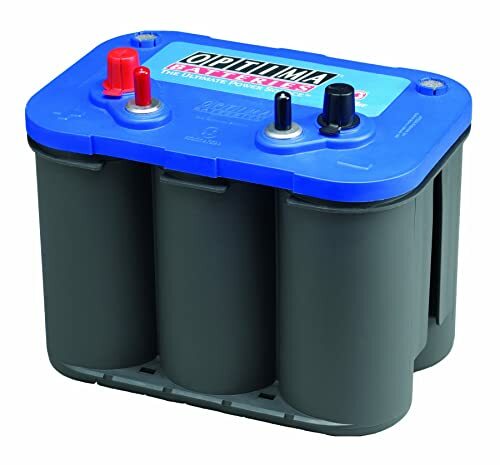 Multi-purpose battery for starting and running boats. Its reserve capacity is lower compared to other optima batteries. The battery is built to start and run boats with accessories. 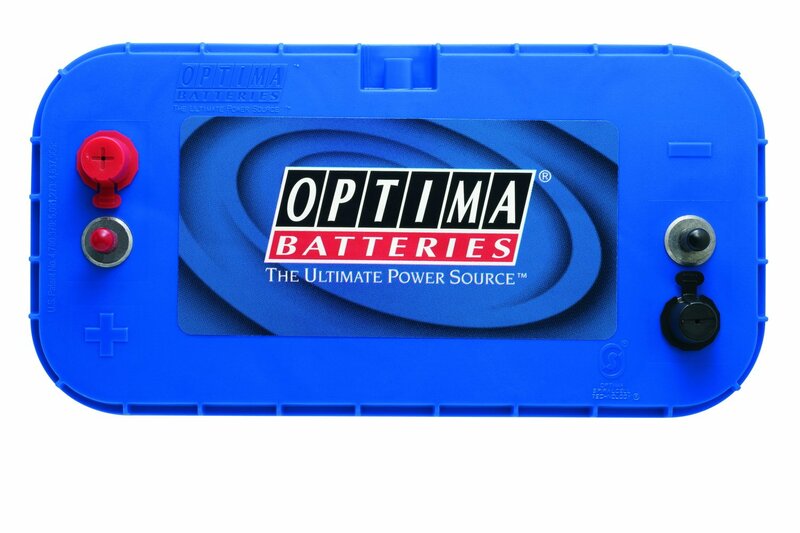 One of the most powerful batteries from Optima is the 8006-006-FFP 34M BlueTop. In fact, it can rival Optima Red Top 34R when it comes to power and acts like a marine starting battery. It is can provide you 4 hours of 40 lbs. motor trolling motor. With a high CCA of 800 and 100 minutes of reserve capacity, the battery can power most electrical devices besides the motor. And since it’s an optima gel battery, it is able to withstand damage, scratches, and bumps. This is further enhanced by the durable plastic cover it comes with. Additionally, the battery is quite light, weighing just 38.4 pounds,. However, you should note that the battery isn’t made for deep cycle use. It only provides sufficient power for starting and cranking. The battery retains the charge longer than most batteries due to the SpiralCell technology. Able to withstand different kinds of weather. Comes with a spill-proof design. Quite reliable in all kind of climate. It is built to function like a cranking and starting battery. So, How do you Choose the Right Battery for Your Car? First things first. Before I even take a look at the market’s best batteries, it’s important to know what you’re actually looking for. So to help you out, here are a few features to check before searching for the perfect battery. You might think all batteries do the same thing. And in a sense, you’d be right. After all, they all give power to your car. But, when it comes to how they deliver power to your car, things become a bit more complicated. As such, you’ll find batteries come in different voltages, prices, sizes, and more. So it’s important to pick the right one for your car. This is hands down the most popular battery out there. And really, its job is all in the name. It’s a battery gets your car started. But more than that, it also provides power to your vehicle’s essential functions. These include lights, ignition, etc. Keep in mind that SLIs will require more frequent recharges than other batteries. So be aware of that when buying. Don’t like messes? Then this is the battery for you! Lead-acid batteries are spill proof and leak proof. In other words—mess-proof. The downside here is that these batteries are sealed. So while this prevents spills, it also prevents servicing. This means once your battery experiences problems, the only solution is buying a new one. So they can thin your wallet if you’re rough with them. A popular lead-acid type you’ll often see with Optima batteries is the absorbed glass mat (AGM). This is where glass mats hold the electrolytes. And yes, they’re still spill-proof. If you’re looking for long battery lifespan, then a deep cycle is the way to go! Typically, these are the YellowTop Optima batteries. And they work perfectly for powering your golf carts and EVs as well! 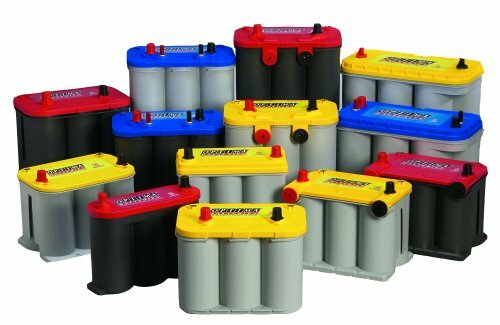 These are your budget batteries. As such, they’re also built cheaply. So expect more maintenance and servicing here. Generally, you won’t find these too frequently under the Optima brand. Next, you’ll want to make sure you pick the right battery size for your car. Thankfully, this step is pretty easy. Each size fits a different make. Here’s a quick overview of common sizes. 65 Trucks, SUVs, and large cars under Lincoln, Ford, and Mercury will use this size. 35 Mostly reserved for Japanese Cars. You know all the big names here—Toyota, Nissan, Honda, Subaru, etc. 51R SUVs, trucks, and cars sold under Honda, Nissan, and Mazda. 25 Light passenger cars sold under Ford, Subaru, Lexus, etc. Almost done! But before I get to the reviews, here are a few final specs that are good to familiarize yourself with. Trust us, you’ll hear these words a metric-crap-ton of times when reviewing batteries. So what better time to get to know them than now? This one’s simple. It’s the power your battery supplies upon startup. As the name implies, this one works just like cranking amps. Only here, it refers to your battery’s starting power in below-freezing temperatures. Remember, batteries are made with chemicals. So when the weather becomes cold, liquids thicken and freeze. So your battery will work differently. As such, if you live in an area with cold climates or winters (Fargo, Rochester, Denver, etc. ), be sure to take special note of this spec. For this one, you’ll want the highest number in minutes possible. In simple terms, this is the amount of time your fully-charged battery will power your car’s electronics before the battery runs out of juice. When is this useful? Think about those times you sit in a parking lot with the engine off. Maybe it’s because your buddy desperately needed a rest stop. So to pass time, you turn on the radio. The RC tells you how long the battery will power the radio (or any other electronics) before it completely drains. Over the years, Optima built a reputation as one of the top battery brands for your car. As such, you’ll find some remarkable qualities here. For starters, Optima batteries won’t emit near the toxic or explosive gasses as other batteries. In general, it’s great for your health, especially giving other cars a jump. And if you’re into saving the planet, it’s less harmful to the environment. You’ll also find that Optima batteries contain a gel substance instead of liquid. So this results in essentially no spills or messes. Ever. While we’re at it, don’t forget about the Spiral Core. This is Optima’s signature design piece. It holds acid in place, which results in no messes. It also ensures the batteries won’t leak or corrode. This is all the better if you take your car to the track or an off-road environment! 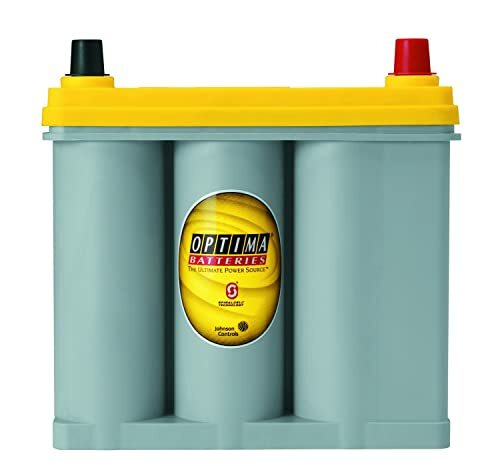 Note that there are three types of Optima batteries out there: Optima Red Top Battery, Optima Yellow Top Battery, and Optima Blue Top Battery. As you will find below, these batteries are different and each has its own unique pros and cons. RedTop vs. YellowTop vs. BlueTop: What’s the Difference? Knowing which Optima battery to buy can always be a tricky process. After all, these are three high-quality types of batteries from the same brand! Therefore, it is essential you know what each battery is all about. 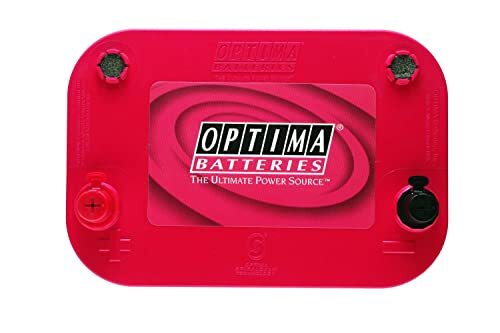 Optima Battery Red Top is the right battery for a car that doesn’t have aftermarket accessories like audio systems. If you read any Optima red Top Battery Review, you will learn that this is a starting battery. Your car uses about 5% of the charge when starting, but this battery easily recharges when alternator kicks in. The Red Top works for a truck, recreational car, and gasoline powered car. Also, it works with heavy systems that draw a lot of power when starting. 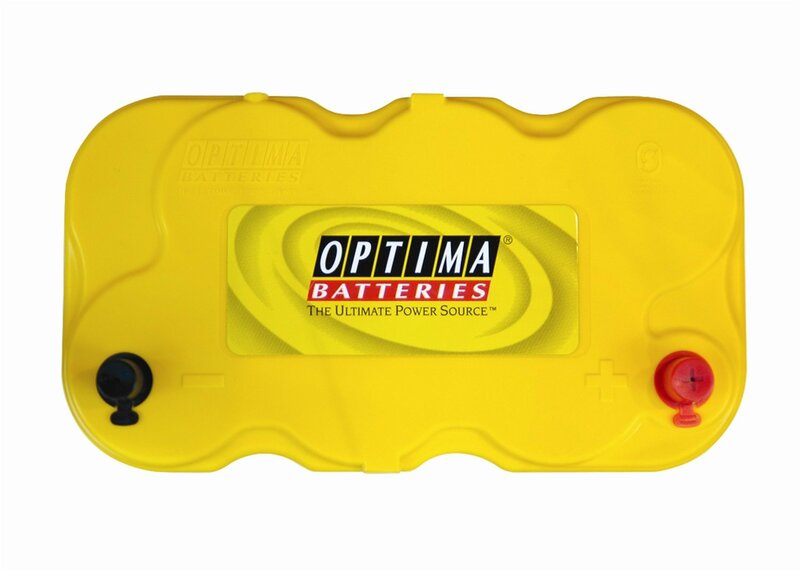 Optima Battery Yellow Top is a dual purpose battery since it provides deep cycling ability to the igniting battery. It is suitable for vehicles that require a lot of power when they have started and those that drain more charge that alternator can replace. This is the perfect battery for a race car or any high-performance car with a small or no alternator. In fact, you can use it to operate your diesel truck or other heavy equipment which turn DC to AC. Moreover, this is the right battery for a car with aftermarket audio systems. 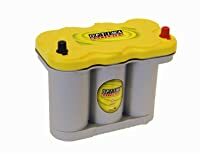 If your car system is 250W or more than the OEM system, go for a YellowTop battery. 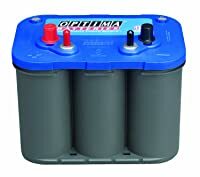 Optima Battery Blue top is the ideal battery for recreational and marine cars. There are two versions of this model and both are perfect for starting cars. These are the starting/deep cycling dual purpose battery and the starting battery. The former comes in a dark gray case while the latter comes in a light gray case. If you have a marine or recreational car with no aftermarket systems, go for the dark gray Blue Top Battery. And if your marine or recreational car has aftermarket systems, go for the light gray case Blue Top Battery. Recommended: Which is Really the Best? Of everything we’ve looked at above, those five optima batteries all offer something to love. But let’s be honest. There’s always a few that tend to be better than the rest. And in this case, it definitely comes down to two of them. So let’s see what helped them rise above the others. Could you really not tell this one would be a winner? After all, it packs everything you could ever want from a battery. Really, it’s hard to go wrong with a reserve capacity of 100 minutes and a freakishly high CCA. Plus, this battery is perfect for any off-road adventure ever. So it’s not just a reliable battery! Instead, it’s an easy-to-install battery that wants you to go bouldering over the weekends and traversing sand dunes over your vacations. When looking for a battery, you want something that’s there for you! And that’s exactly where the Optima 25 RedTop comes into play! First things first, this battery offers the longest battery life of any Optima RedTop. So that alone propels it to the top. Because really, is a battery even worth having if you need to replace it every six months? Of course not! You’re almost better off buying a new car at that point! Likewise, this is a battery that will keep your car powered for plenty of years to come! Plus, it packs some pretty stellar specs as well. In fact, I’ll be honest; it was really hard to find anything to dislike about this one. Need some help deciding between the above winners? Well, here’s a quick spec sheet to help you see where each gains a slight advantage over the other. I all know that procrastination is the enemy to success. And this couldn’t be any truer for your car. So pick up your battery today! Whether you need one now , or just for a reserve, you can’t go wrong with an optima brand battery.